Once again, I've come to the time of year where I can't decide if it's still soup weather or not. Some days lately it's been up in or near the 70's with sunshine streaming in the windows, inviting me to unpack my summer box of clothes. 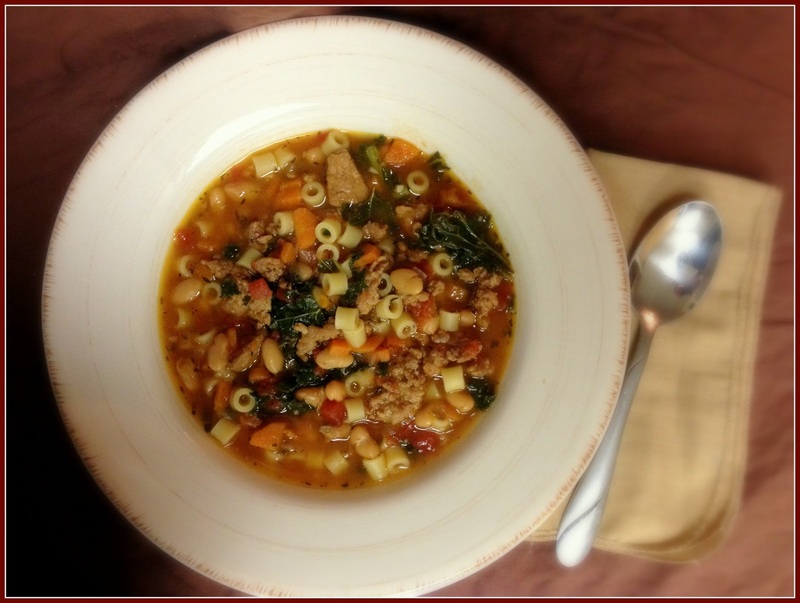 But other days, like today, the gray returns and the chill creeps back in like an unwanted guest who has overstayed their welcome.The warm sunny days make me eager to dust off the grill and make big crisp salads, but when the rain and fog roll back in I still cling to my warm, comforting, hearty soups. This soup is so delicious that even if it's warm where you are, you might not want to wait for fall! 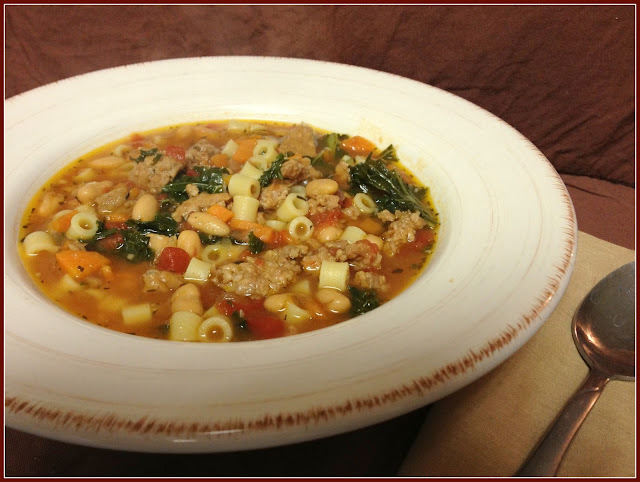 It is full of hearty things like sausage, beans, pasta, and of course, veggies! The sausage adds a bit of zip and the kale gives it a vibrant freshness. In a large skillet, brown the sausage; remove from pan and drain off the fat. Do not wipe clean. Add onion, carrot and olive oil and saute 2-3 min. or until softened. Add garlic and saute about a minute more. Combine sausage, sauteed vegetables, tomatoes, chicken broth, thyme, bay leaf and salt and pepper in crock pot. Cook 6-8 hrs. on low setting. 15-20 min. before serving, add pasta; stir. Cook on high until pasta is almost tender, about 10 min. Add kale and stir, cooking for several minutes or until wilted.